“Get ready for your next assignment”, was a phrase I kept hearing from my father. It was still a time when Soviet Russia was building an atheistic kingdom in my homeland and several generations were living without any hope for change. It was the same with the Church. Even, as in Acts 12, the Church was fervently praying…but it was hard to believe. I could not understand what kind of assignment might be next for me. But my father was encouraging me to continue studying English, working at the factory, and faithfully serving at the church. That was my world and then at the age of 20, I got married and family was added to that list. Raising four kids was an assignment! Most senior and even executive leaders know what their next project will be before it begins. With time, I have learned that my father was in a minority because he believed in preparation beforehand. He was able to combine his faith with hard work in order to make sure that he and his family lives in a way that honors the Lord regardless of blessing or hardships of life. 1 Peter 1:18 became a personal motivational revelation for me: ‘Jesus redeemed me from the empty way of life’. I took those words very personally and asked the Lord to help me to say “NO” to the empty way of life. A constant presence of education, work and ministry could bring a good balance to everyone as a person. And at the same time, this style of life is a good ground for new seeds of faith to be planted. One year after ‘perestroika’ came to my country, the Lord challenged me to start a church planting institution, well known today as Ukrainian Evangelical Theological Seminary. When I asked His guidance in building a leadership team of those who can train church-planting teams, the Lord reminded me that I was able to learn personally by keeping the process of training, work and ministry united. That was the first challenge, because for many of us on a team, we were ready to believe that the whole focus was supposed to be solely on ministry, trusting the Lord’s guidance by His Holy Spirit and in Him, meeting all our daily needs. After almost 25 years of experience, it is possible to learn how to increase acceptance of failure by improving our return on it. It is crucial to learn from every failure and even more, to share the lessons we learned in order to help ourselves and others to review, if needed, a pattern of failure. Real freedom comes when leaders learn to extract the maximum value from a failure. It is also less painful to the whole organization and protects the company/ministry from a fear of failure. 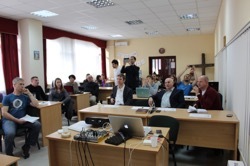 Today, a number of theological institutions introduced TOW to their training programs in Eurasia. Among leaders, I would name the following five: Ukrainian Evangelical Theological Seminary, Saint-Petersburg Christian University, Lvov Catholic University, Moscow Theological Seminary, and Kuban Christian University. CCX (IFES in Ukraine) ministry is strong in using “Profession as Mission” program. Seven years of my regional ministry as Lausanne Movement representative for Eurasia has helped to make Theology of Work available in 12 countries of the former Soviet Union. Systematically organized Regional consultations are gathering evangelists from different denominations to many nations with Russian speaking diaspora. At the same time national churches wanted to be even more effective on local level and needed some encouragement. “We need to make stronger our sense of urgency”, one senior pastor of the Central Baptist Church in Kiev told me. Together with almost 200 pastors of different Evangelical churches in Kiev, they committed to a citywide concept of evangelism. Priority #1 was to train 50 evangelists for all major areas of society, government, business, and market. “Finally, music and message are in tune with my life”. Recon Education Center is a first stage of Recon College development. Two years before leaving seminary, I sensed to take time in understanding, making and managing media. This new assignment is truly a challenge. I had to read the Bible from a mass media perspective to see heroes of faith as effective communicators. The world of media is a total darkness, and Jesus wants us to bring His light to that world as well. Media, especially digital, determine all aspects of our everyday lives. Young people literally live in virtual media world, even sleeping with their gadgets. Many of them are very talented in IT area, but cannot achieve media life and business changing experience. Recon media training is targeting those talented people to use their gifts for His Kingdom, working in local church or local business. Media is the shortest way of engagement with the global workplace as well as global proclamation of the Gospel. Let me share with you few thoughts from my team of co-founders of Recon. It is a fact that the Lord was preparing them long time ago for our joint assignment. This course is to confirm the ministry calling of those in market place and business as part of God’s plan of salvation, for all to have a joy from work. This course is to deal with the undebatable truths that drive and direct behavior and decision-making. Time will be taken to develop personal and organizational core values. This course is to learn from the Bible how the Gospel “conquers” the world by penetrating its major cities. It will help students to understand how faith impacts the world of business, government, services, as well as media outlets.